A video released by the city of Cleveland shows a police officer pushing a 14-year-old girl to the ground and handcuffing her with the help of another officer soon after a third officer fatally shot her younger brother. The grainy surveillance video shows the officers struggling with the teen before putting her in the back seat of a patrol car parked next to where 12-year-old Tamir Rice lay on the snowy ground bleeding. Northeast Ohio Media Group is reporting that it obtained the nearly 30-minute-long video from the city on Wednesday after the city initially refused to release it. Other media outlets were given the video Thursday. Patrol officer Timothy Loehmann shot Tamir in the abdomen within two seconds of a patrol car stopping near the boy on Nov. 22. He died the next day. 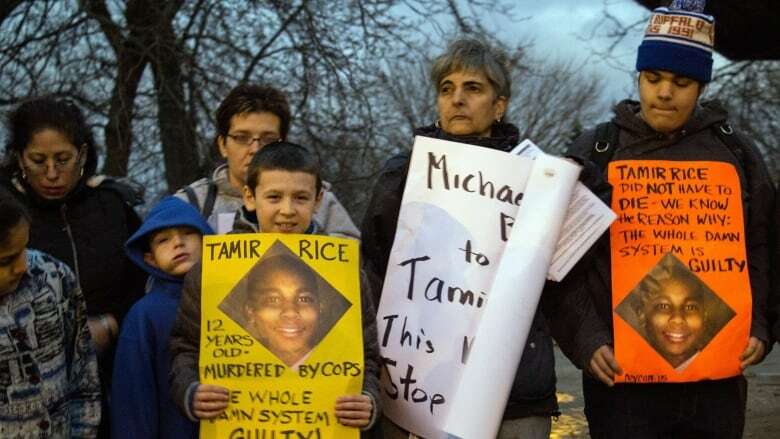 Tamir's family gave the city permission to release another version of the video days after the shooting. That video shows Tamir in a park near a recreation centre carrying what turned out to be an airsoft-type gun that shoots non-lethal plastic pellets. That video ends with Loehmann shooting Tamir. Loehmann, a rookie, and his training officer and the driver of the patrol car, Frank Garmback, had responded to a report about a man with a gun. A police union official has said the officers thought the gun was real and that they didn't know Tamir, who was five-foot-seven and weighed 195 pounds, was so young. The new video begins with the shooting of Tamir. About 90 seconds later, Tamir's sister, whose name has not been released, runs toward her fallen brother and Garmback immediately pushes her to the ground. Garmback and another officer are then shown handcuffing the struggling teen and finally placing her in the back seat of Loehmann and Garmback's patrol car. Walter Madison, an attorney for the family, called the treatment of the 14-year-old sister, who he would not name, "the cruelest thing I've ever seen on video." He also criticized the officers for not providing Tamir with medical attention. An FBI agent on a bank robbery detail nearby arrived about four minutes after the shooting and began first aid. A city spokesman declined to comment about the video on Thursday. The city last week turned over the investigation of the shooting to the Cuyahoga County sheriff's department. The county prosecutor is expected to present the case to a grand jury to determine if criminal charges should be filed against Loehmann and Garmback.